African Honey Bees are called killer bees because of their aggressive attacks against people and animals. These attacks can be brought on by crossing into their territory, but they attack happen just as often for no reason. Regular bee colonies attack only after being attacked themselves or being exposed to a big commotion. African honey bees on the other hand can attack just because of simple noises or vibrations. Merely turning on a car or driving it into a driveway can anger these bees to the point of brutal attacks. You might ask yourself why these bees are so aggressive, and that all goes back to 1956. During this year African bees where brought to the tropical lands of Brazil and interbred with European honey bees. The goal of the scientists who did this was to develop a stronger bee that would be better adapted for tropical climates. It all went wrong when some of the bees escaped and began multiplying and migrating to other regions. With the European honey bees’ genes for tropical climates, and the African bee’s aggressiveness, the new breed was simply unstoppable. To understand why African honey bees were so aggressive, even before being brought to Brazil, you’d have to look into their history and environment. African bees have always been sought after by people, as well as Honey Badgers and birds. To survive these bees had to develop defensive and offensive techniques. For example, they break hives into multiples new groups to insure that if one is attacked, the other can survive. When it comes to defensive measures, African bees will chase enemies up to a mile so that they do not harm their hive. When fighting as colonies, African bees follow enemy bees and attack them. Unluckily for humans though is that the bees can’t really tell bug enemies apart from humans trying to get on with their lives. While African bees only cause a handful of human deaths a year, their attacks are very harmful and can bring on other health complications. Those that are allergic to bees are also at a high risk of being harmed by these bees. You should continually check your home and surroundings for bee hives every couple of weeks during the spring and summer. Killer bees can create hives in sheds, flower pots, trees, and other places within a matter of days. It’s important to stay on top of colony developments because if they pick an area for building their colony and you take it down, they will continue to try building there. Not to mention that you may be attacked for posing a threat to the colony. Since African bees will easily attack because of noise and other commotions, it’s always a good idea to keep children, pets, and spouses inside when using any equipment which generates noise. If you’re cleaning outside it’s also important to check for bee hives before moving things, because you could unleash an entire colony if you move something and break a hive that was there. Wearing cologne, perfumes, or shaving lotion when hiking, grilling, or working is also a bad idea. These smells confuse bees and could also get them to attack. If there is a hive or colony of African honey bees on your property, or any bees for that matter, you shouldn’t try removing them without professional help. 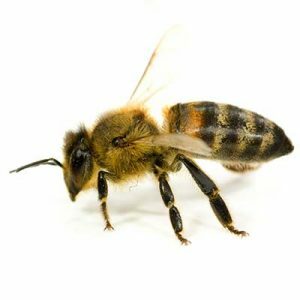 At Ace Pest Control we’ve been in the pest control industry for over thirty years and have seen too many home owners get attacked when trying to remove bee hives. In the event that you are attacked by bees you should get into your home, car, or other closed off area as fast as you can. Do not try jumping in the pool because African bees are aggressive and will wait for you to get out before attacking again. Trying to hit bees or playing dead also will not work. If you can run into your home or try outrunning the bees, then you’ll be better off than trying to swat away at dozens, if not hundreds, of angry African bees. If you’re not allergic and were bit under 10 times you may be fine, but any higher amount of stings should prompt immediate medical attention. For no hassle and no risk African honey bee eliminations, just give us a call at (702) 871-1211.